Thailand Politics: FILE - Sombat Boonngam-anong gestures a sign of freedom while arriving at the military court in Bangkok, Thailand, June 12, 2014. A decision by Thailand’s military government to end military trials for most civilian crimes is drawing praise and skepticism from rights activists and lawyers, who say further steps are needed, including a return of freedom of assembly. Prime Minister, Prayut Chan-o-cha issued the order ending the military court’s jurisdiction over offenses linked to internal security, sedition, and insulting the Thai Royal Family. Soon after coming to power in May 2014, the military initially imposed martial law. But the junta, known as the National Committee for Peace and Order (NCPO), later strengthened its hold by way of an interim constitution allowing for trials through military courts. Since then, the military courts have heard more than 1,500 cases involving more than 1,800 people throughout the country, most on weapons charges. 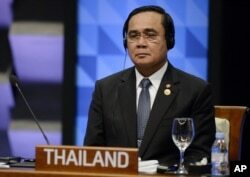 Thai Deputy Prime Minister and Defense Minister Prawit Wonsuwan said the new order reflected the government’s confidence over control over the country. But in comments to Thai media, he warned the order would be reinstated if the domestic situation changed. Angkhana Neelapaichit, a member of the Thai Human Rights Commission, said while the commission welcomed the move, it called on the government to take further measures to advance human rights. “The cases that they will send to the civil court, I think this is very good. For me I think it’s like the government has come to respect the rights of people more but we have to try more to convince the government to accept the rights of people for freedom of expression and the right to peaceful assembly. It might be the next step,” Angkhana said. The United Nations’ Human Rights Office for South East Asia (OHCHR) also welcomed the government’s decision, but called for the policy change to be applied retroactively. But Prime Minister Prayut ruled out any transfer of security related cases that are still pending in military courts. Legal rights advocates also questioned the military courts’ procedures. A report by the International Commission of Jurists (ICJ) and the Thai Lawyers for Hunan Rights (TLHR) to the U.N. Human Rights Council raised irregularities in the military courts, including a failure to grant public access in some cases as well as long administrative delays. Kingsley Abbott, an ICJ Asia Pacific representative, said doubts were raised over the military court processes, with the 500 civilian cases still to be heard. “More than 1,000 civilians have already been through that court system and have faced unfair proceedings and unfair trials, and many of whom have been convicted some for merely exercising their rights of freedom of expression or freedom of assembly,” Abbott told VOA. Among those charged include a board member of Amnesty International in Thailand, Baramee Chaiyarat, who is also a coordinator with the non-government group, Assembly of the Poor. In cases of Lese Majeste, a crime imposed for insulting the monarchy, a military court imposed sentences of 30 and 28 years in jail for a man and woman arrested after several Facebook posts deemed critical of the Thai Royal Family. A representative with the Thai Lawyers for Human Rights, Sirikan Charoensiri, said the military court process was also weakened by questions over its independence. Rights lawyers have also claimed that at least 18 people held in military detention since May 2014 have raised allegations of torture. Thai Lawyers for Human Rights say the allegations of mistreatment by the police and military are not being adequately investigated, including charges of the use of electric shocks, mock execution and other death threats. Rights activists say the Thai military has the power to detain civilians at military camps for up to seven days without charge, while restrictions on freedom of expression remain in place. But Pornpen Khongkachonkiat, Director of the rights group, Cross Cultural Foundation, fears more people may be facing abuse but are fearful of raising the allegations with authorities. “The system is not supportive. So they tend not to report because they think that further on it will be a bigger problem that will be on them. So the role of us – the human rights defender is to open the space for victims to speak,” Pornpen said.